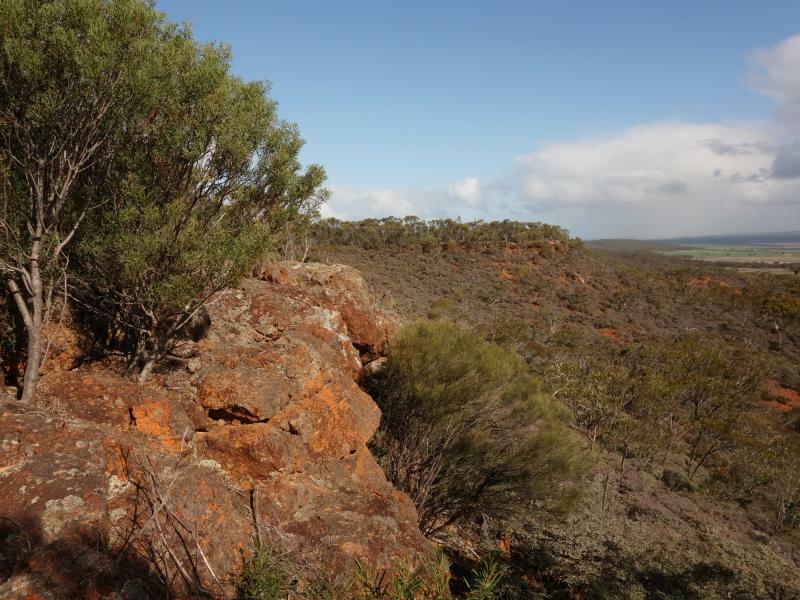 Wongan Hills Nature Reserve (also known as the Mt Matilda Walk Trail) is a 418 hectare reserve approx 12kms west of Wongan Hills on the Waddington/Wongan Road. The landscape of the hills is a complex of ridges dissected by steep gullies with the rugged ground unsuitable for farming and grazing. It remains an island of natural vegetation surrounded by cleared farmland. The highest point of the reserve is Mt Matilda at 434 metres above sea level. The walk trail on Mt Matilda provides one of WAs top five walk trails, it is dotted with interpretive signs explaining the different flora & fauna that can been seen during the walk. There are 2 walks you can take, one being approximately 3 hours and the scenic walk (out to Speakers Chair) takes about 5 hours to complete. Flora of the Wongan Hills is extremely diverse with more than 250 species of flowering plants, some that do not occur anywhere else in the Wheatbelt. There are 16 different species which are unique to the Wongan Hills, five species gazetted as rare flora in the Nature Reserve and numerous species of priority flora.